Detects when you have mixed tabs and spaces and offers to fix them for you automatically. 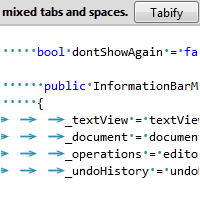 Helps to manage the whitespace inside your document and assists in keeping consistency in the use of tabs and spaces. Warns users when a file opened or saved that contains a mixture of tabs & spaces. Adds an information bar to provide an easy way to fix the file if desired.